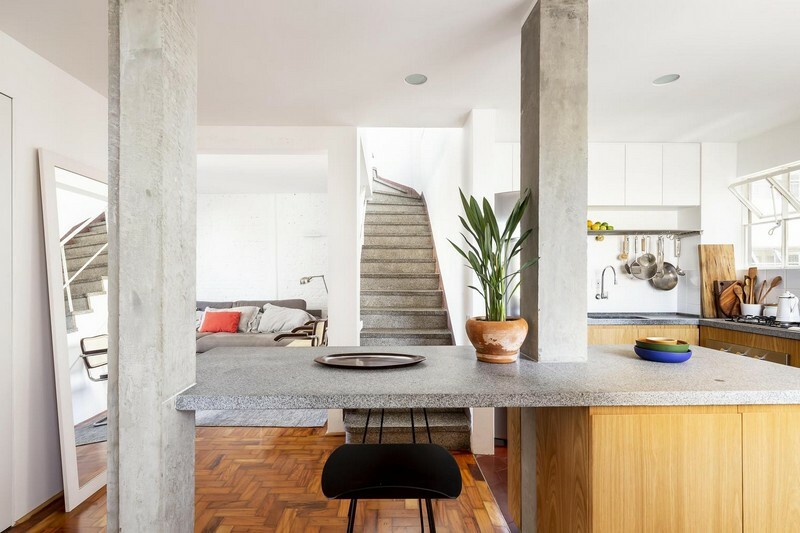 The post 1950s São Paulo Penthouse Gets an Original Upgrade appeared first on Freshome.com. Brasil based Estúdio Paralelo completed the restoration of a 1950s São Paulo penthouse and revamped it for the needs of contemporary city living. The space has a total surface of 150 square meters (1615 square feet) and also displays an unconventional layout. “The apartment absorbs both floor-plans of the two apartments per floor of this small building in Santa Cecília, each one with 60 square meters (646 square feet), and organizes the space in a fashion that is curious for the time in which it was constructed,” the architects said. They kept many of the original elements, such as the granilite in the staircase and the wooden floors. They restored other details, like the iron windows with electrostatic paint as well as the terracotta cementile flooring. The complex array of textures gives the São Paulo penthouse an original feel.